John Kenneth Muir's thoughts and comments about Battlestar Galactica have appeared in a variety of publications, in addition to his own book from McFarland. Below is a listing of when and where some of Muir's remarks were carried on the series, as well as the substance of those comments. These are John Muir's opinions, as he expressed them. 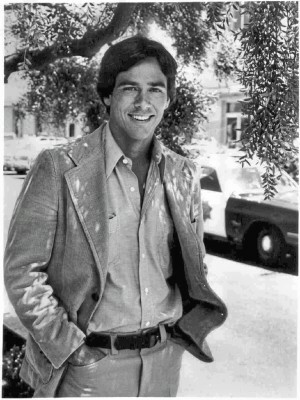 Most recently, journalist Paul Hughes called John's book a "doctoral thesis" on Battlestar Galactica, and noted that John "remains one of the show's preeminent critics and fans." (Amazing Stories, February 2005, page 40). 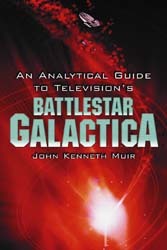 John Kenneth Muir, author of An Analytical Guide to Television's Battlestar Galactica, agrees that the intricate themes provide a depth normally overlooked by the show's detractors. "There was this fascinating [philosophy] that a lot of other science fiction shows hadn't used It [Galactica] really had an interesting world view." -Annabelle Villanueva, Cinescape Insider: Battlemania! - March 1999, page 95. "The message of BATTLESTAR GALACTICA is enormously positive. By incorporating themes, ideas, plots and archetypes from the Bible and Greek mythology, it showed us how we are all brothers stemming from the same root, the same source. I think that is a very positive, very worthwhile message in an era when racism is still an issue." I also think BG had a brilliant message about preparedness, which was particularly relevant because the series aired during the Cold War. In "Experiment in Terra" Apollo talks before the Terran Praesidium about strength through preparedness and he could have been lecturing at a GOP convention. I think that's great. If you look at it, Ronald Reagan defeated the Soviet Union with defense preparedness, by pushing a strong national defense...I always wonder, did Reagan listen to Apollo in that episode of BATTLESTAR GALACTICA? In this instance, BG proved to be absolutely correct...and prophetic." 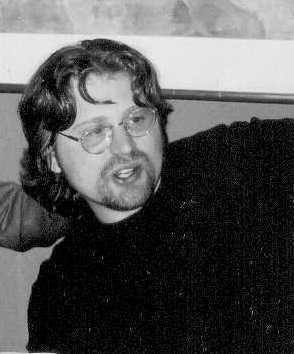 -Battlestar Fan Club Interview with Shawn O'Donnell, 2000. "I think it would be a large mistake to go forward without the original cast in significant roles, and I think it would just give fans the opening to have a schism....Some people would accept it as the heir apparent, some people would say its not legitimate." -The National Post, by Dan Brown, June 4, 2001. "They're interviewing the cast, the crew and artists behind Battlestar Galactica and what they needed was somebody to put it in a kind of historical context and a sort of critical context...What did Battlestar Galactica do well? What did it not do well? What's its legacy after 25 years? Would it be worth reviving?...That kind of thing. That's what they used me for. They called me and said, 'We're going to fly you to L.A.' And that was great..."
-The Union Observer, July 7, 2000. "Now Colonel Tigh is a drunk who is hated by Starbuck. The relationship between Apollo and Starbuck - now female, seems to promise a sexual relationship instead of brotherhood, which is different, but not necessarily bad, depending on how it is handled. And Apollo and Adama have 'issues' with each other. To me, this all smacks of soap-opera contrivance. Will Tigh pull it together, get off the booze and save the ship? Will Apollo forgive Adama his trespasses? Will Starback be able to control her temper?..." -Paul Hughes, Amazing Stories, February 2005, page 40. "I wrote a book all about the underpinnings of the original Battlestar Galactica in 1997, which was published by McFarland in 1998, entitled An Analytical Guide to TV's Battlestar Galactica....I argued there - hopefully persuasively - that the original Battlestar Galactica had its flaws, but that despite them, it was a unique and interesting series. And for a number of reasons, I claimed this was indeed so. The great expense of the original 1978 series (more than a million dollars per episode...) assured imaginative costumes, impressive sets, and the best and most convincing special effects yet developed for American television (Space:1999 was British...). 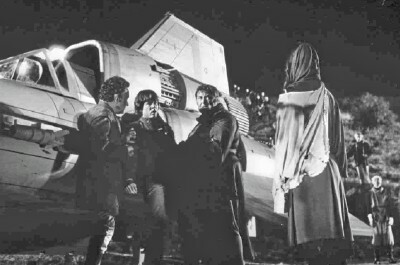 On top of production values, enormously appealing actors like Dirk Benedict and Richard Hatch made the show more than the Star Wars rip-off the MSM wanted to make it out to be, and as the show developed over the weeks, it actually boasted something akin to a story arc. Finally, I also felt the original Battlestar Galactica had an interesting hawkish philosophy that differentiated it from Star Trek, and an interesting use of Christian and Greek/Roman mythology. On the latter front, for instance, Battlestar Galactica made more than a token attempt to remind us that the lead characters were all from another planet, another solar system. The characters had names like Athena, Apollo, Lucifer and Adama, and in the first episode, the survivors of the Twelve Colonies crossed a red-hued mine field that was the equivalent of the Red Sea. The characters said "yahren" instead of year. When they cursed, it was "frak" or "felgercarb." When they smoked a cigar, it was a "fumarello." when they counted down time units it was "centons" and "microns." Dogs were "daggits" and dollars were "cubits." It might have been ham-handed or silly at times, but this attempt at a legitimate Colonial language/lexicon granted the Battlestar Galactica world a veneer, at least, of otherworldly reality. We actually believed that these were "brothers of man," out in space; people like us, but not actually from Earth. We could suspend disbelief. And for me, that's the thing that's almost wholly absent in the ripped-from-the-headlines, September 11th-style "reimagination." I was shocked to hear Starbuck quote the Tom Cruise movie Top Gun (1986) in one episode, noting a pilot cadet's "need for speed." I was disappointed to hear thoroughly Earthbound references to "stogies" (instead of fumarellos) and "lemonade." I was disappointed that all the characters wear contemporary-style ties, business suits and glassses, and that on occasion, are wont to exclaim "Jesus" rather than say "Oh Gods" (as they often do in the later episodes). Whoa! The feeling that these people are from another world (another friggin' galaxy, maybe!) - and not models starring in Pier One commercials - is totally lost in this new Galactica. And for that reason, I keep wanting to scream at the screen - you ain't from Earth! You haven't seen Top Gun!..." -John Kenneth Muir, John Kenneth Muir's Reflections on Film/tv, "Making Lemonade: Or I Feel the Need, the need for Speed...on the new Battlestar Galactica, June 16, 2005. 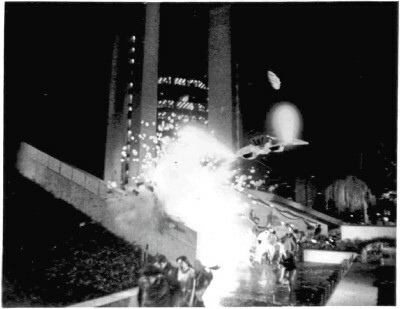 Above: Artist Mindy Easler's Battlestar collage, from John's Book. "...hands down the greatest, most detailed, comprehensive guide to Battlestar Galactica ever written...must have..."-John Dorsey, LT. SHEBA's GALAXY. "Mr. Muir staunchly defends his chosen subject [Battlestar Galactica] especially against the charge it was a mere Star Wars rip-off. He believes it was part of a science fiction explosion in which both films and television shows took part. The book itself looks at the continuing phenomenon of Battlestar Galactica and how interest in it continues both with fans and producers. ; It also contains an interesting appendix of all the stock footage and models recycled for Buck Rogers in the 25th Century, another Glen Larson project." - Sean Delaney, TV SCI FI GUIDE, BRITISH NATIONAL LIBRARY, page 19. "John Kenneth Muir has authored a superb analysis of the Battlestar Galactica TV series, noting the show's many critics, its strong audience pull and so forth. He analyzes all 17 of the show's episodes...Muir's overall analysis...is spot on. ; He recognizes Battlestar Galactica as an enjoyable and thought-provoking series." -Mike Daly, Battlestar Zone (c) 1999. 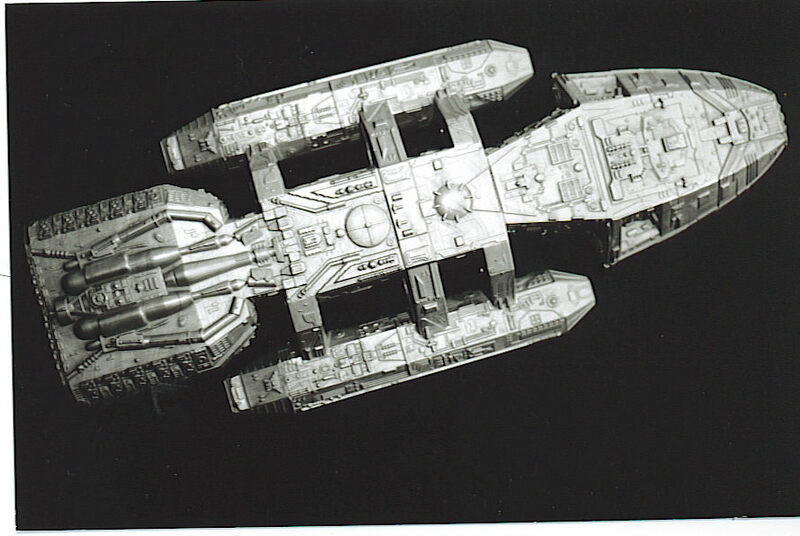 ...Before examining the specific storylines and episodes of Battlestar Galactica in relation to the mythology veneer, it is appropriate to first consider the central characters of the series and determine whether they have been named appropriately, considering the qualities of their mythological forebearers. Since Commander Adama is the spiritual and military leader of the fleet and of Battlestar Galactica as a whole, let us study his name first. Adama is a moniker derived from the Old Testament name for the first man to inhabit the Earth, Adam. In Hebrew, Adam means man; but Adam also comes from the word which means Earth. Thus it is appropriate in Battlestar Galactica that the character Adama is the one who suggest the exodus to distant Earth, since his own name, his very identity, is inextricably linked to that destination. However, Adama does not fulfill the role of Adam completely. Although he may lack companionship and the comfort of a woman, BG's Adama is not an innocent nor does he dwell in perfect paradise. On the contrary, Adama is a battle hardened soldier who defends himself and his people with fightercrafts called vipers. That name is significant as well. Adama is not tempted by a serpent (a viper), but he is protected by them instead. It is conceivable, one supposes, that the 12 Great Colonies of Man could be considered a Garden of Eden-type paradise and that by leaving it, Adama is liberating his people from perfection and innocence, but that interpetetation is no doubt stretching the matter. No, Adama indeed fulfills a biblical role, but he is not related only to Adam. He is also Moses.